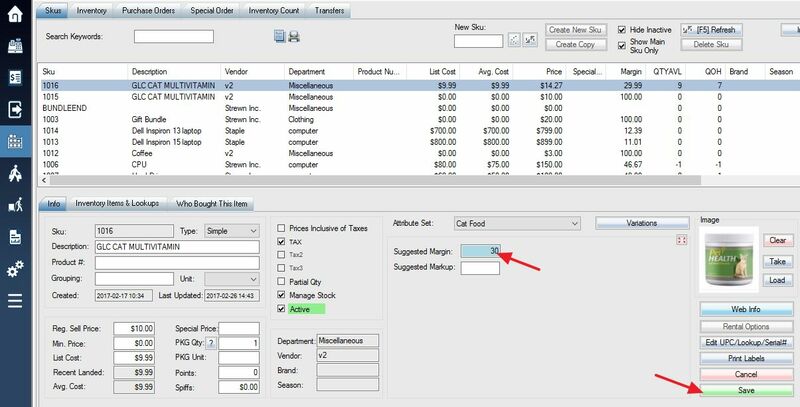 In order to setup pricing based on a suggested margin percentage, you need to create a special attribute called Suggested Margin. When you add the “Suggested Margin” attribute to a SKU, it will automatically add a desired margin % to the average landed cost of the SKU. 1. Create a new SKU attribute (see: Adding New Attributes) with the name “Suggested Margin” and the “Decimal” format. 2. Now you can add the desired % value of Margin based on the Landed Cost of the SKU.Click Save to finalize your Margin changes. 3. The system will calculate the suggested retail price. You can decide if you accept the price or not. To calculate Sell Price with the Suggested Margin attribute based on ListCost or AvgCost instead of the default LandedCost, turn on switch 023 or 024.